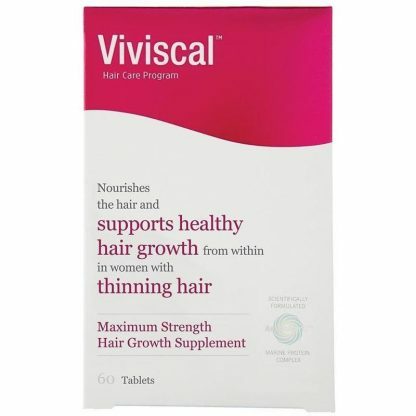 Viviscal supplements are fortified with the key nutrients Biotin and Zinc which help maintain normal healthy hair growth from within and the proprietary marine protein complex AminoMar C™. Only Viviscal supplements contain AminoMar C™. Viviscal supplements also contain Vitamin C, Niacin, Iron, and Millet Seed. As described in the Healthy Hair Growth Cycle hair can be in a different growth stage of the cycle. Over time, the length of the Anagen stage decreases, therefore the hair may become weaker and thinner after each cycle. This is why it’s important to ensure your diet is rich in specific nutrients throughout your life. ** Viviscal Pure Profile Survey, June 2013. Viviscal offers scientifically formulated products that promote healthy hair growth from the inside (Viviscal Maximum Strength dietary supplements) plus gorgeous hair on the outside (Viviscal Densifying Elixir, Densifying Shampoo and Densifying Conditioner). Recommended daily intake: Take 2 tablets daily for a minimum of 3-6 months (1 in the morning and 1 in the evening taken with water after food). Thereafter, to maintain healthy hair growth take 1-2 tablets daily as required. Ingredients: Shark Cartilage (From AminoMar C™) 375mg, Acerola Fruit Powder 8.8mg, Horsetail Extract 248mg, Millet Extract 143mg, Vitamin C 57mg, Zinc 11mg, Biotin 120mcg, Vitamin B3 12mg and Iron 10.5mg. Warning: Dietary supplements should not replace a balanced diet. Children, pregnant or breastfeeding women and those who have recently had a heart attack, surgery or major accident should not consume this product without medical advice. If symptoms persist consult your healthcare practitioner. Use only as directed. Excellent product and very good services except for the Australian Post.